® HIGH-TORQUE ROTATING TREE SAW CompaCt traCk & Skid Steer LoaderS FEATURES Increase your Flexibility & Improve your Capability with our HIGH-TORQUE Rotating Tree Saw designed for Power & Xcellence. • HIGH-TORQUE, HIGH-EFFICIENCY Motor • FULL 180° of Drift-free rotation • HIGH TORQUE MOTOR reduces stalls and jaMs • ADVANCED HYDRAULICS for longer Motor life • Plug & Play for oeM in-cab controls* • rotary actuator for Precise angle of attack • Motor Wind-doWn Protection • 5 gal. integrated Herbicide systeM A Full 180° of Hydraulic Powered Rotation - Anytime. 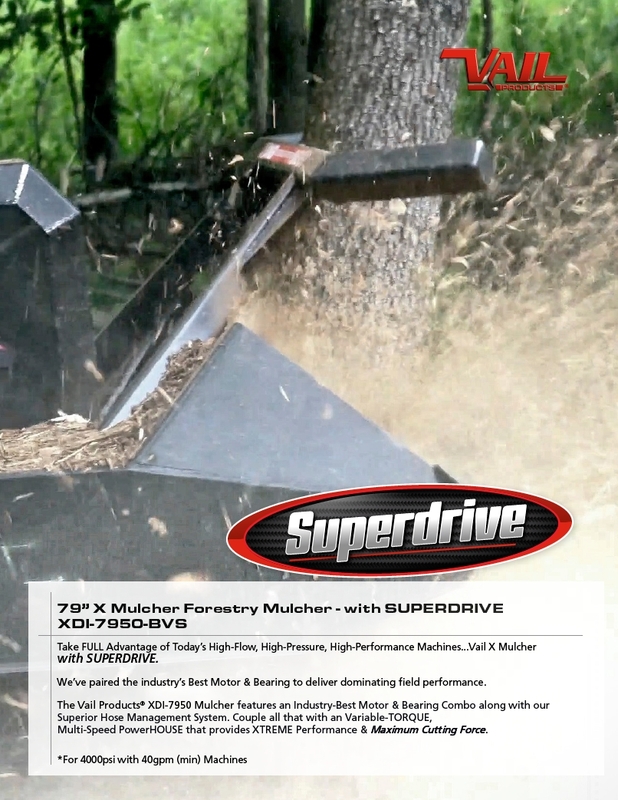 TREES•DENSE BRUSH•SHRUBS Low Flow & High Flow Options America’s Land Clearing Equipment Specialists VAIL PRODUCTS® VAILXSERIES.COM 1-844-XSERIES (973-7437) Call © Hammersmith Mfg. & Sales Inc.